the crusoe beach house has all the aspects of a tropical home you may have stayed at in your dreams, far away from everything and everyone. located right by the sea on the little island gili meno, there is no traffic around whatsoever. the only sounds you will hear are those of the sea, the wind, some birds and horse cards. 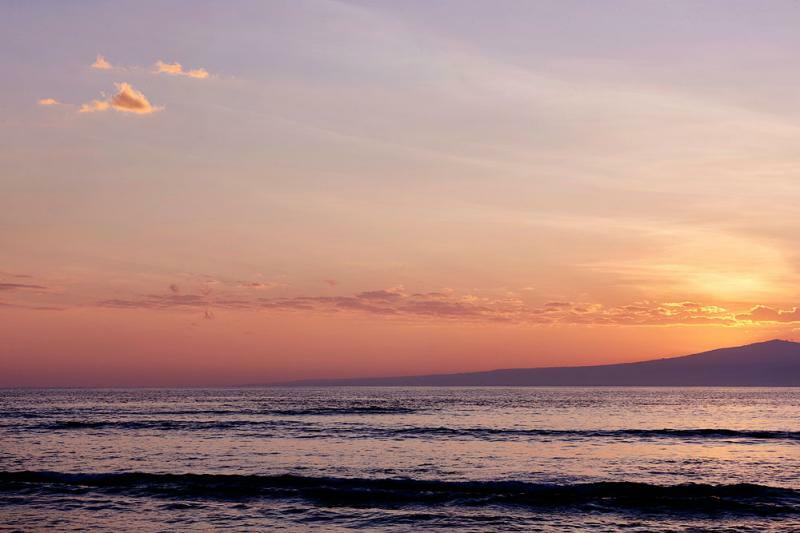 it truly is an idyllic setting to find peace of mind and spend undisturbed quality time with loved ones. 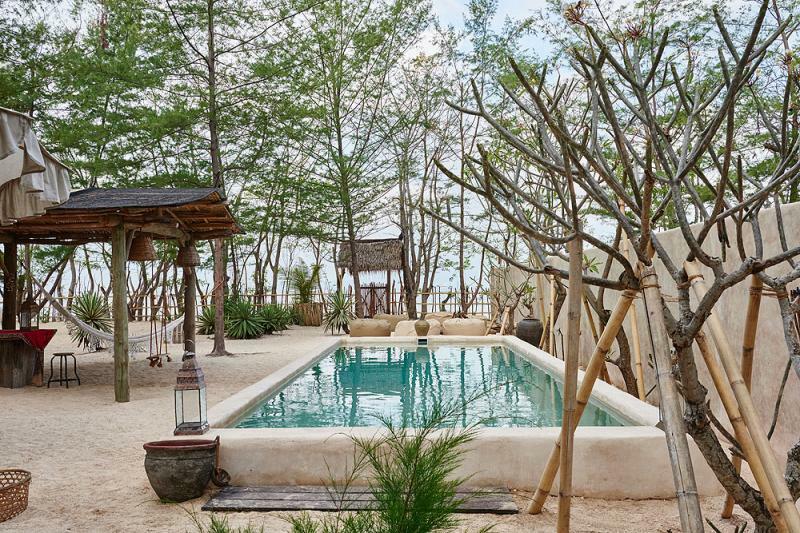 this gili meno house, part of the island houses, exudes a lovely and charming ‘ back to basic’ feel, and yet, it has got all the comforts and facilities of a luxury stay at the same time. tropical traditional architecture and interior design are combined with access to a private fresh water swimming pool as a welcome alternative to the salty sea, speedy wifi throughout the property, air-conditioning in the bedrooms, and hot water in the bathrooms. 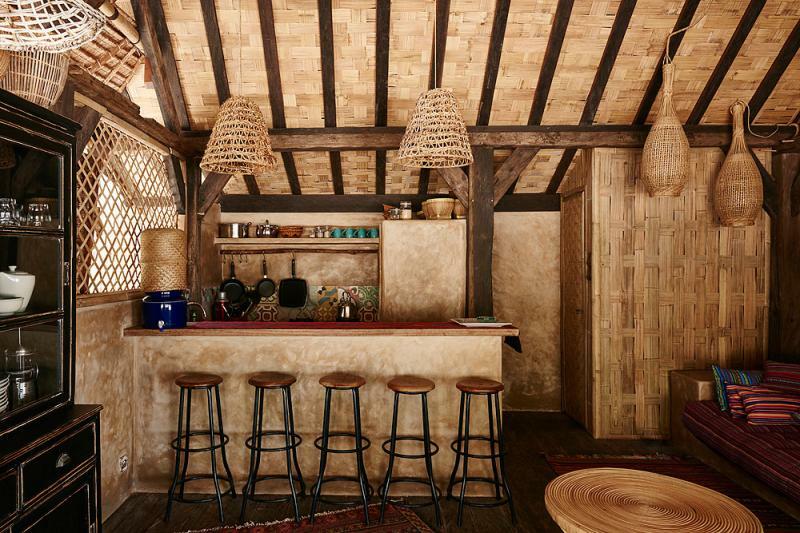 the crusoe beach house was designed and decorated with love and care by the owners themselves and it was built in perfect harmony with nature using locally sourced natural materials such as timbers, bamboo and rattan. the result is an exquisite beach house that blends in seamlessly with its surroundings. 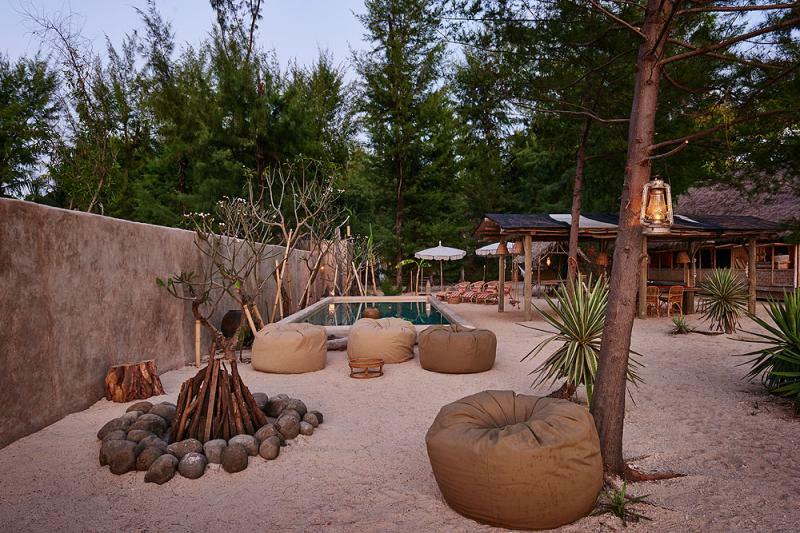 the fireplace surrounded by bean bags and the hammocks hanging in between the trees of the sandy beach front garden only add more charm to this tropical getaway. 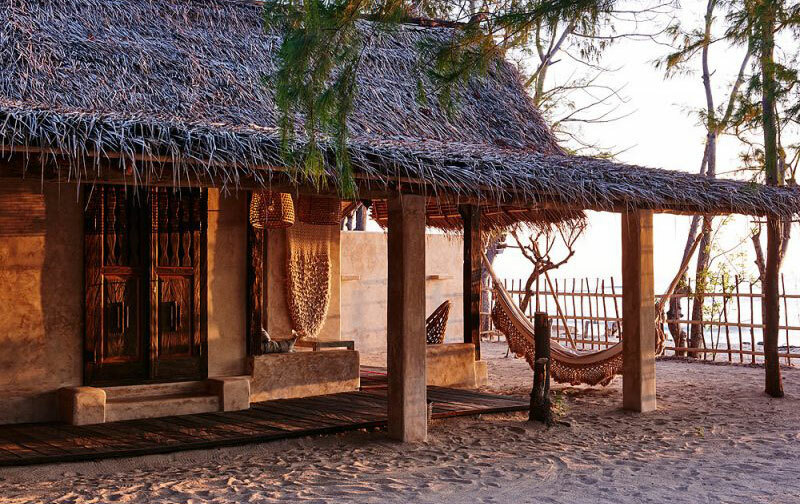 the interiors are ruled by handcrafted furniture, traditional textiles and carpets and the 5 beach hut-style bedrooms with their shady verandas and tropical thatched alang alang rooftops, are all perfectly natural and they make restful sleeping quarters to retreat to at night. 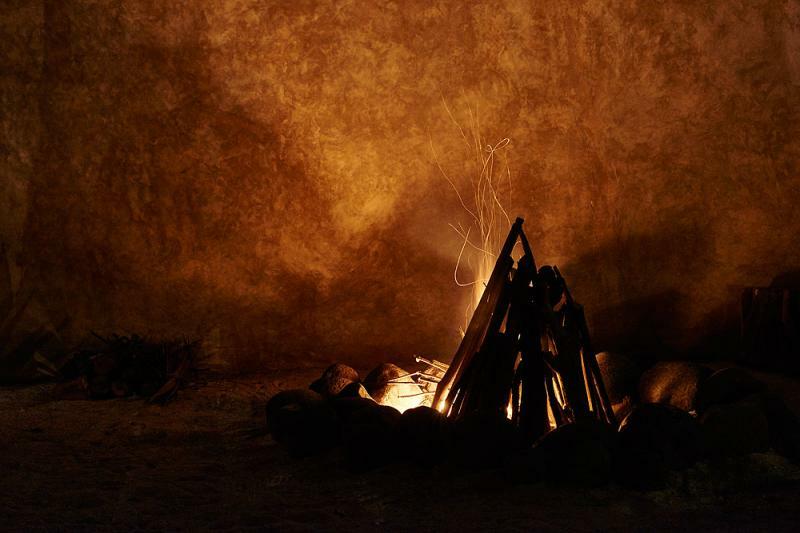 the 3 bathrooms found within the property feature lovely open air designs to enjoy a reviving cold shower in the morning and a relaxing hot shower in the evening or even soak in a bathtub beneath the stars. every morning, you get to wake up to the view of the ocean and the fresh sea breeze that gently hurls around the island, making the leaves of the palm trees dance and sway in the clear blue island sky. go for an early swim in the pool first thing in the morning, before even taking a sip of your coffee. time slows down naturally at this island house, allowing you to take a break, catch your breath and feel reborn again before heading back to the daily routines of life. a great snorkeling spot, where you can spot exotic fish and even turtles, is found right in front of the crusoe beach house and bicycles are available complimentary, should you feel like exploring the island. gili meno is the smallest of the 3 gili islands as well as the most tranquil and the most romantic one. those who like to party are off to gili trawangan, those who are into yoga head to gili air and those who want absolutely nothing but peacefulness and unspoilt island beauty – welcome to paradise at gili meno! book easily with our booking client or let us personally take care of your special requests.